"You don't believe, do ya?" IFC has unveiled three teaser trailers for a new ghost horror movie titled Ghost Stories, which already premiered at the London Film Festival earlier this month. It's due out in 2018 but doesn't have an exact date yet. 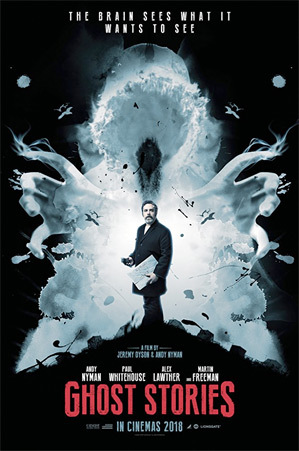 Based on the long-running British horror stage show created by English magician Andy Nyman, the film is about a psychologist and arch-skeptic named Professor Phillip Goodman who investigates three terrifying hauntings. Andy Nyman plays Goodman, and the rest of the ensemble cast includes Martin Freeman, Alex Lawther, Jill Halfpenny, Paul Whitehouse, Nicholas Burns, Kobna Holdbrook-Smith, Daniel Hill, Derren Brown, and Ryan Oliva. It seems like an anthology film, but it also seems like there is a connection between the three stories. I'm very curious to see this film. Ghost Stories stars Andy Nyman as Professor Phillip Goodman, a psychologist and arch-skeptic, who has his rationality tested when he stumbles across a long-lost file containing details of three terrifying hauntings. He then embarks on a mission to find rational explanations for the ghostly happenings. 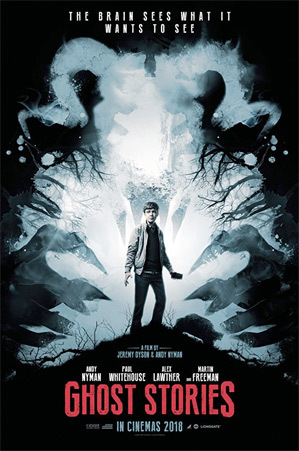 Ghost Stories is both written and directed by English filmmakers Jeremy Dyson ("Psychobitches") and Andy Nyman, both making their directorial debut working together. This is based on the long-running British horror stage show created by English magician Andy Nyman (who also stars as the arch-skeptic Professor Goodman) and Dyson. The film premiered at the London Film Festival this fall. IFC Films will release Ghost Stories in select theaters + on VOD starting in early 2018. Stay tuned for an exact date. First impression?